For $150 and a 300-word essay, hopeful restaurant owners could land a successful restaurant and a place to live in one fell swoop. Whoever wins Fuel will immediately own a successful restaurant, a great place to live, an extensive wine cellar, and everything in the restaurant - plus $20,000 in the bank. For $150 and a 300-word essay, hopeful restaurant owners could land a successful restaurant and a place to live in one fell swoop during “Maine’s Dream Restaurant Contest.” Essays are being accepted now online at fuelcontest.com and by mail, to Fuel Essay Contest, PO BOX 591, Lewiston, ME, 04243, to win Fuel restaurant and a two-bedroom condo. Entries will be accepted online until October 17, 2016 at midnight and by mail through October 14, 2016. 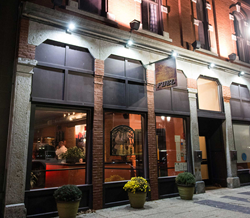 Fuel, located at 49 Lisbon St. in the heart of downtown Lewiston, is a thriving modern French bistro with a lounge and event space called Sidecar. The restaurant, founded by owner and Maine native Eric Agren, has been open for 10 years. Agren is also the developer of the eight new condominium units next door to Fuel. “Whoever wins Fuel will immediately own a successful restaurant, a great place to live, an extensive wine cellar, and everything in the restaurant - plus $20,000 in the bank,” said Agren. “I’m excited to hand over the keys to Fuel and the properties to someone with a dream who is ready to own this restaurant and the real estate, and be part of this great community,” added Agren. The contest includes the custom built, 7,000 square foot commercial space and the recently built 1,600 square foot two bedroom and two bathroom condo at 43 Lisbon St.
Agren, a lifelong entrepreneur, is frequently credited with assisting with the revitalization of downtown Lewiston. He is also the founder, and former owner, of Marche, a wine bar and restaurant also in Lewiston. Lewiston is the second largest city in Maine and is well known for its rich history and culture dating all the way back to early French explorers. Today Lewiston boasts a dynamic restaurant, arts, and entertainment scene. It is home to Bates College, which ranked #25 for Best Liberal Arts College in the U.S. (according to U.S. News & World Report) and is the location of the nationally renowned Bates Dance Festival. In addition, the annual Great Falls Balloon Festival and the Dempsey Challenge, a fundraiser started by actor Patrick Dempsey (also a Maine native), are both held in Lewiston. Lewiston is a premium location for mountain biking, paddling, hiking and skiing, with the mountains, lakes, trails and waves just a short driving distance away. For all details and to enter Maine’s Dream Restaurant Contest, visit fuelcontest.com. The winner will be selected by a panel of independent judges (excluding Agren), who will review the anonymously submitted essays. The winner will be notified after October 25, 2016.